Project management includes excellent techniques to allocate, use, and monitor resources to achieve a goal in a desired time frame. In a scientific setting, goals may include the set-up of experiments, the allocation of grants, publishing a paper, or even achieving tenure. Participants who complete this comprehensive workshop will learn how to initiate, plan, and execute a project that meets objectives on time and within budget. Seminar room B305, Building B, CLE-reception, Epalinges 1066, Chemin des Boveresses 155 (both days). Dr. Sina Henrichs holds a doctorate in Molecular Biology from the University of Zurich, as well as MBA in Academic Management form the University of Basel. Dr. Henrichs has extensive experience in implementation and development of project outlines in the academic environment. With the dual science and project management background, Dr. Henrichs combines her extensive research experience in the life sciences and in-depth understanding of process development and project management to provide the workshop participants an interactive and professional training experience. Dr. Henrichs is also the founder of Manage Science (www.managescience.ch). This entry was posted in Uncategorized on 11 December 2018 by Veneta Gerganova. Welcome to APNS at UNIL! 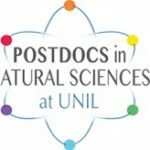 We are a postdocs association open to all postdocs interested in Natural Sciences! Join us and check out our upcoming events! You can also find us at the monthly aperos (Beer O’Clock) in Epalinges co-organized with ADAS! If you have ideas or suggestions please contact us! This entry was posted in Uncategorized on 3 December 2016 by Santiago Carmona. First part of the participants gives a presentation in front of the group. Instruction presentation on general considerations on communication, storytelling applied to science and slide design. Series of warm-up and stress management exercises. A few points on how to best use technology (pointer, camera, videos…*). Second part of the participant gives their presentations in front of the group. Personalized and intense 15-minutes coaching sessions for every participant. *The talks and the coaching sessions will be filmed and the recordings will be sent to each participant. About the instructor: Sam is a multi-talented scientist and improviser. He teaches presentation skills to experts and curates (SamSpeaksScience.com), coaches and hosts the TEDxLausanne conference since 2012. He manages the Geneva branch of the Lausanne-based Catalyst theatre company which creates new media to communicate science (thecatalyst.ch). He performs and teaches improv to individuals and applied improv to corporate clients with the Renegade Saints (renegadesaints.ch). In his scientific career, Sam studied sensory perception in the normal and in the schizophrenic brain, in France, the United States and in Switzerland. He combined microscopy, behavior and electrophysiology to characterize a genetic model of schizophrenia developed in mice. 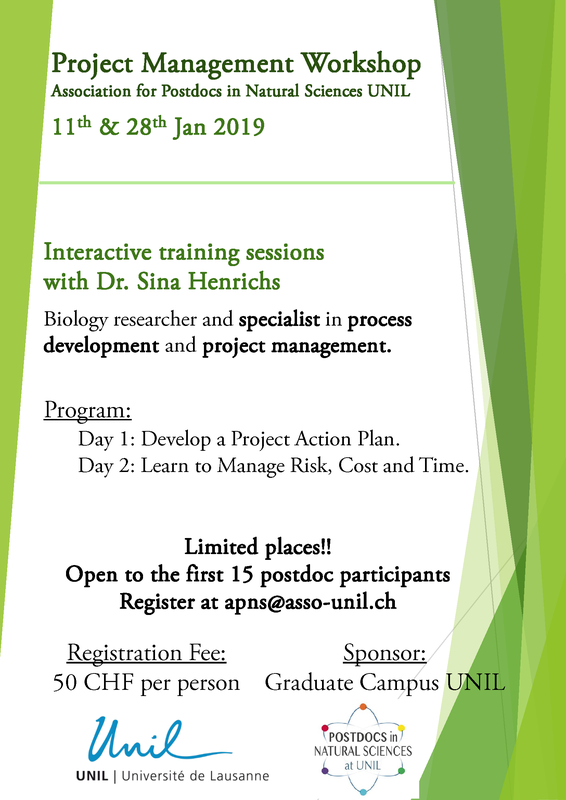 For registration, please send an email ASAP with the subject “Public Speaking Workshop” including your info (Name, Department, Lab/Group, end date of your UNIL postdoc contract) to organizers from APNS: santiago.carmona@unil.ch and nathalie.isorce@unil.ch. After having reached the attendees’ quota, we will contact the first 13 postdocs with instructions on how to make the payment of 20 CHF that will be required for final confirmation. We will keep a waiting list to refill places in case of cancellations (non-refundable). Science communication is part of a scientist’s everyday life. Scientists must give talks, write papers and proposals, communicate with a variety of audiences, and educate others. Thus to be successful, regardless of field or career path, scientists must learn how to communicate. Moreover, scientists must learn how to communicate effectively. Effective communication means transmitting our message clearly and concisely so that it is understood. Being able to articulate our work to a broad audience can have a tremendous impact on the discoverability of your research and the trajectory of our careers. Furthermore, effective science communication between researchers, resource managers, decision makers, and the general public has long been recognized as a critical need for the advancement of science in general. Most scientists know how to give an objective and rigorous presentation, but only a few speak about their work with compelling and engaging stories. In this context, we propose a workshop on scientific public speaking with Samuel Lagier. This entry was posted in Uncategorized on 23 March 2018 by Santiago Carmona. The APNS General Assembly took place at the Biophore building, room 2917.2, Campus Sorge from 18:30 to 20hs. The APNS Council (Dr Veneta Gerganova, Dr Marco Mina and Dr Santiago Carmona), Dr Silvia Fuertes Marraco (External Advisor) and 5 members of the Association were present. During the meeting, the mission of the Association, statistics on current members (39) and electronic platforms of APNS were presented and reviewed. Next, the main events organized by APNS during the 2017 period were summarised (i.e. Figure 1A Scientific Art Exhibition and Postdoc Retreat). Following, the planned events for 2018 were presented and discussed. APNS members Mukul Girotra, Sabrina Foerster, Thais Reichler and Nathalie Isorce volunteered as co-organizers for different Actions that will take place during 2018. Afterwards, the financial statement for 2017 was presented. Finally, the Assembly voted for its Council members. Dr Marco Mina (former Vice-President) becomes Treasurer. The Secretary position remains open. 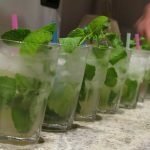 This entry was posted in Uncategorized on 23 February 2018 by Santiago Carmona. The Association of Postdocs in Natural Sciences invites you to a General Assembly + Apero on the 21st February, 2018 at 18:30h at the Biophore, Campus Sorge! Learn about our 2017/2018 projects and hop on board! We are recruiting committee members and organizers, so if you want to gain experience in this area don`t be shy. We have plenty planned for the year – project management seminars, a scientific art exhibition, participative and interactive workshops, career retreats. 1. Review of 2017 events. 3. Announcement of open positions. 5. Official re-election of leadership committee. Hope to see you there! 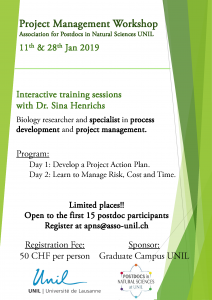 If you cannot attend, but you are interested in the association, drop us a line at apns@asso-unil.ch. This entry was posted in Uncategorized on 20 January 2018 by Veneta Gerganova. The SV postdoc association and the BioScience Network Lausanne together with the Association for Postdoc in Natural Sciences at UNIL are gladly continuing our collaboration with the Novartis Institute for Biomedical Research (NIBR) in Basel: the Novartis-EPFL-UNIL (NEU) Meeting. The 5th NEU meeting will take place on the 15th of December 2017 (Friday) in Basel. The aim of this meeting is to promote interactions among researchers conducting similar types of research in academia and in industry. In addition, this year an HR representative will present information on the ideal profile of a job candidate for Novartis. PhD students and postdocs will have the opportunity to present their work and learn about research at NIBR. Besides, participants will attend exclusive lab visits at NIBR. Please note that this meeting is not meant to be a job fair. We are looking for PhD students and postdocs from EPFL and UNIL performing research in life science. You will have the opportunity to present a poster and we kindly ask you to submit an abstract (300 words max, no figures) following registration. Please note that you will need your advisors permission to present your work at NIBR. The registration will start on the 2nd of November and the deadline is on the 9th of November 2017. After registration we will send you a link for abstract submission. Abstracts have to be submitted by latest of 20th of November 2017. Your abstracts will be treated confidential and the organising committee will select participants based on their abstracts. The results of the selection will be communicated by 27th of November 2017. This entry was posted in Uncategorized on 2 November 2017 by Santiago Carmona. The aim of the retreat is to provide postdocs with the utmost current and relevant information regarding the scientific climate in and out of academia. For this reason the invited speakers are professionals who have successfully entered their respective fields over the past few years in Switzerland and who can provide information and advice about the most recent challenges that exist in each area. The retreat will offer an open and relaxed environment, where everyone should feel free to engage in discussion and to share their knowledge and experiences. Important: Registration is free, but attendees will have to cover their trip from Lausanne to Finhaut. An SBB train ticket with Demi Tarif both ways is 40.20chf. 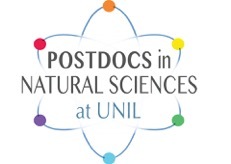 *for more information on the Postdoc for Postdoc action from the UNIL Direction, visit our Useful Links section, tab: Propose and organize an event for postdocs. This entry was posted in Uncategorized on 27 August 2017 by Veneta Gerganova. An Extraordinary General Assembly will be held next Tuesday April 4th 2017 at 5.30PM at the boulangerie Pouly (Flon, next to Payot bookstore). We will take this opportunity to summarise what we have achieved from the association in the past 4 months since its Council renewal, present our planned events for 2017-2018 and have the chance to meet APNS members interested in collaborating or joining this council. This entry was posted in Uncategorized on 31 March 2017 by Santiago Carmona. The first APNS Postdoc Welcome Apero together with legendary ADAS Beer O’Clock! Come and join us in this awesome apero! It will be a great opportunity to meet each other and welcome new postdocs and other members of our community! The legendary Beer O’Clock this year will jointly organized by ADAS and APNS. 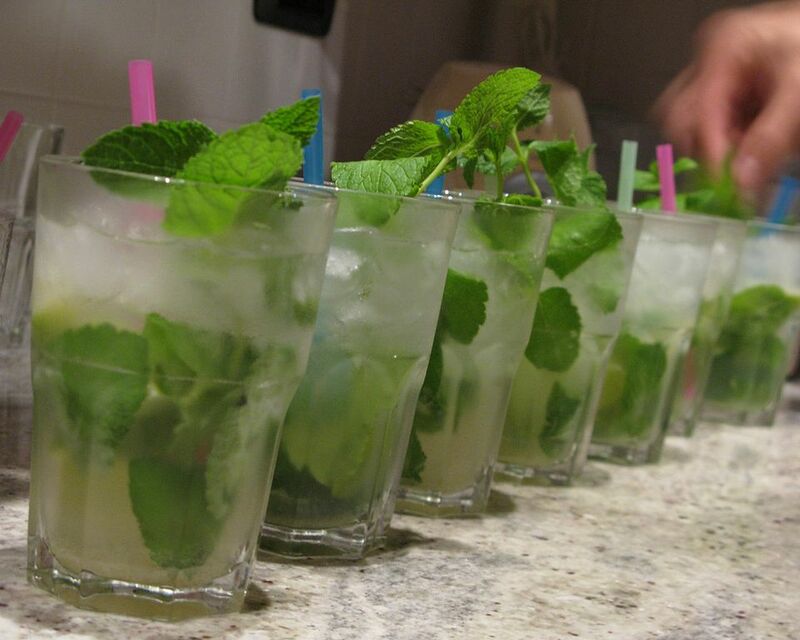 We will offer Mojitos for 3CHF, beer and wine for 2 CHF and some snacks for free. This entry was posted in Uncategorized on 3 February 2017 by Santiago Carmona. welcome to our new association! 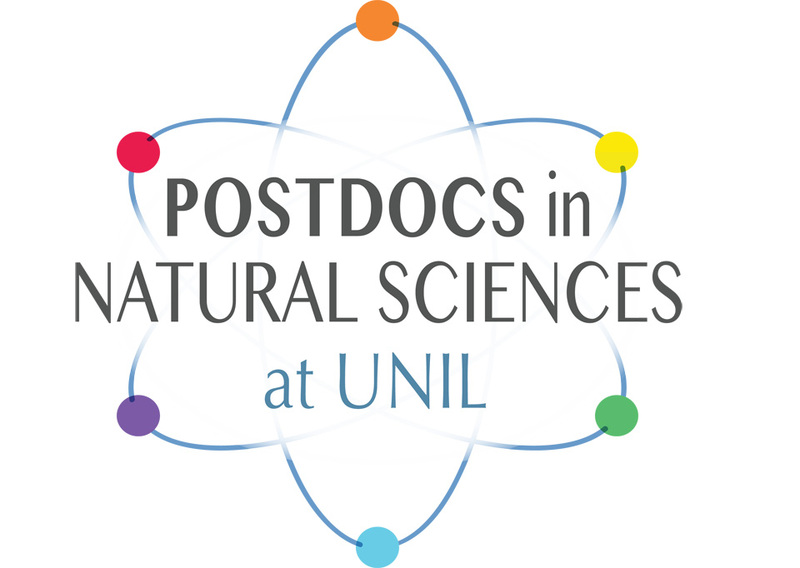 We are proud to announce the official start of our association for postdocs in natural sciences at UNIL! Interested in knowing more? Join us now and receive emails about future events! WE ARE RECRUITING MEMBERS! Including committee positions that are open! Feel free to join our committee meetings at Polli Flon, at 17.00 (date to be announced). We have several events in planning, full details can be found above on our “events” page. This entry was posted in Uncategorized on 13 April 2015 by Silvia Asuncion Fuertes Marraco.